Who or what is CGR ? 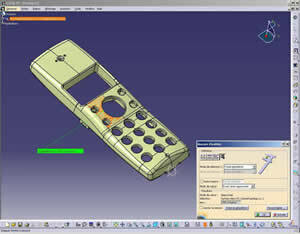 The CGR (Catia Graphical Representation) is the triangulated format used by Catia V5. This faceted surface representation makes it quicker to load Catia V5 CatParts and CatProducts, and naturally facilitates the sharing and exchange of files. Datakit recently launched its full CGR read and write capability. This technology can be integrated by software developers or used in industry to convert a range of files, JT and STL type faceted formats, as well as Catia V4, V5 and Unigraphics to CGR format. CGR geometry from versions R14, R15 and R16 is supported. Facets, groups of facets and boundaries are supported as well as attributes such as textures and colours. Assemblies are handled and enable the exchange of CatProducts stored in a single CGR file. Also, the FDT data will provide access to valuable dimensional and tolerancing information for each part. A team with a range of complementary skills was assigned to Datakit's Catia V5 team to develop a complete CGR conversion product as fast and optimised as the files using this format. Datakit CEO Francis Cadin explains: "it was a priority for some of our customers to get to grips with this format. We made it our business to make this possible. You have to recognise that CGR is a very special format that forced us to dig deep. On a purely technical level, our experience of processing the different types of Catia V5 data did not count for much. However we did have the advantage of already offering our customers a very comprehensive range of products for Catia V5, from the 3D part and assembly geometry, via 2D and all FD&T data, construction history and features to data for very specific manufacturing applications such as notching, for example." This conversion tool will be of particular interest to departments in large manufacturing companies that are reluctant to work from native Catia V5 files, either because the files are too bulky, or because they don't have a CATIA V5 licence, or the people are not trained in the use of Catia V5. It also delivers a solution to sub-contractors who are looking for away to submit their work in a Catia V5 file or include CAD data in bid documents, without necessarily giving away all the details to their customer. Francis Cadin adds: "major software vendors have already endorsed our tool for reading and writing CGR. The increasing number of file exchanges and the development of collaboration have created a massive opportunity for formats like CGR. We recognised the importance of providing a complete conversion tool. The feedback from our customers so far suggests that we made the right decision."